The November election will probably be incredibly close. It will be hugely important. We face great challenges and honestly — real mysteries. We don’t know for sure what’s causing global warming, whether further stimulus spending will work, how to respond to the European debt crisis, how to bring our own deficit down, and what will bring jobs. Anyone who tells you they KNOW – and lots of people will – is lying to you or kidding themselves. The combination of genuinely big problems and great uncertainty create this result: heightened anxiety. And ungodly amounts of spending will generate ads aimed at fanning those emotions of uncertainty, fear, and anger. Inevitably, candidates will exploit the emotions. Who, but you and I, can bring light rather than all this useless heat? As everyday leaders — which is what democracy calls us to be — we want to be effective, we have got to be cool and strong. The sum total of our discussions and debates will be important not only to determine winners — did I mention this election will be incredibly close? — but also for our democracy itself. Our civility may help states keep from lurching from elections to recalls. And our civility is critical to create an atmosphere where people regain patience and confidence with the tough decisions government must make. Amidst the heat, the negative ads, the superpacs, and hysteria, we need to stay cool. May I suggest a goal – simple but profound: engage your own family, friends and co-workers in a way that contributes to a civil dialogue, the kind this great democratic republic deserves. I recommend an absolutely wonderful book for this purpose. I invite you to buy it along with the flags, sparklers, M-80s, and Bud Lites that have come to symbolize the 4th of July. Maybe read it before Labor Day and the national conventions; arm yourself! It’s called How to Restore Sanity to Our Political Conversations. 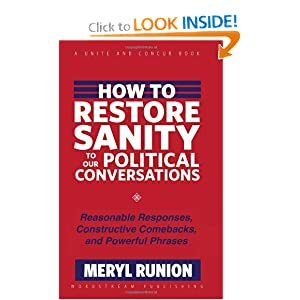 Meryl Runion, the author, is brilliant when it comes to communication; you’ll learn or re-learn truly valuable lessons not just for political communication but for any tense discussion. But I think you’ll find it gives you hope about democracy and about your own ability to contribute to it. At least “look inside” the cover as they say on Amazon and give it a chance.